Cold and flu season is here. In fact, I have a nasty head cold right now. After a couple of back-to-back trips, stress, and losing sleep, my body fell victim to a rotten bug. It’s okay; I’m powering through with the help of some great products to help ease a sore throat and cough. But, I’d rather skip the sick and just stay healthy. So, I’ve put together a simple list of cold and flu season tips to remind us all to take care of our immune systems. This is a sponsored post written by me on behalf of Jewel-Osco. Something we all need to understand and embrace is the power our immune systems hold. The first step in fighting illness is making sure your defenses are up and as strong as possible. We’re all constantly being bombarded with information about immune boosters, but it’s simpler than some imply. Sleep. Get all the sleep you need. That’s different for all of us. Know your body and make it a priority to give yourself as many hours as you need to feel your best. For me, that means going to bed around 9:30 pm and getting up at 6:00 am. This is rarely easy with my workload and family schedule. However, it’s doable if I just make it happen. Hydrate. Drinking enough water, to me, is like a full-time job. I constantly forget because I have little to no natural thirst. It takes all sorts of tips and tricks to keep me mindful about drinking the daily eight. Diet. If your diet consists of mainly fast and/or processed foods, try to swap something for fresh fruits and vegetables. Your immune system will only be as strong as what you feed it. It needs nutrients–all of them–some more than others, but a balanced diet is paramount. Supplement. Do not rely on supplements. They are literally meant to supplement a healthy diet. But it’s darn hard to get everything our bodies need from just food. Taking a multivitamin is smart. And, if you feel like you may be fighting something, it’s a great idea to add additional Vitamin C, Zinc, and gargle with salt water. Destress. Stress is an immune system killer. Read a book, take a nap, drink tea–whatever helps you unwind, do it. Think of it like medicine prescribed by your doctor. It happens. We all fall victim to those wretched germs occasionally. Thankfully, there are a plethora of products to help make us feel better when we’re miserable. The best part–thanks to the Signature Care™ brand of products, we can get quality products at a great price. Being sick already costs us our time and energy. There is no reason we should have to overpay for symptom relief. Signature Care products contain the same active ingredients and are subject to the same manufacturing standards mandated by the FDA as national brands. They even come with a 100% satisfaction guaranteed or your money back promise. These cough drops are saving my sanity. I have that heinous scratchy tickle that’s making me want to just hack nonstop, and it’s causing my already raw throat to feel as if it’s bleeding. But these calm all that down and are allowing my body to rest. The Signature Care line is exclusive to the Albertsons Companies family of stores, including: Albertsons, Safeway, ACME Markets, Vons, Pavilions, Randalls, Tom Thumb, Shaw’s, Star Market, United Supermarkets, Market Street, Albertsons Market and Carrs/Safeway. I buy them at my local Jewel-Osco in the Chicagoland area. Our “Jewel Store,” as we’ve called it since I was sitting in the cart still has some of the same employees from my childhood. They’ve now watched my kids grow out of the cart and are like extended family. We love seeing familiar faces and catching up in the check-out line! When you think about “sick foods,” soups and smoothies probably come to mind. But, tomato sauce, especially when paired with garlic and oregano, can be a major immune booster. Packed with vitamin C and a plethora of other nutrients, this hearty meal is ready in under 20 minutes and feeds the whole family. 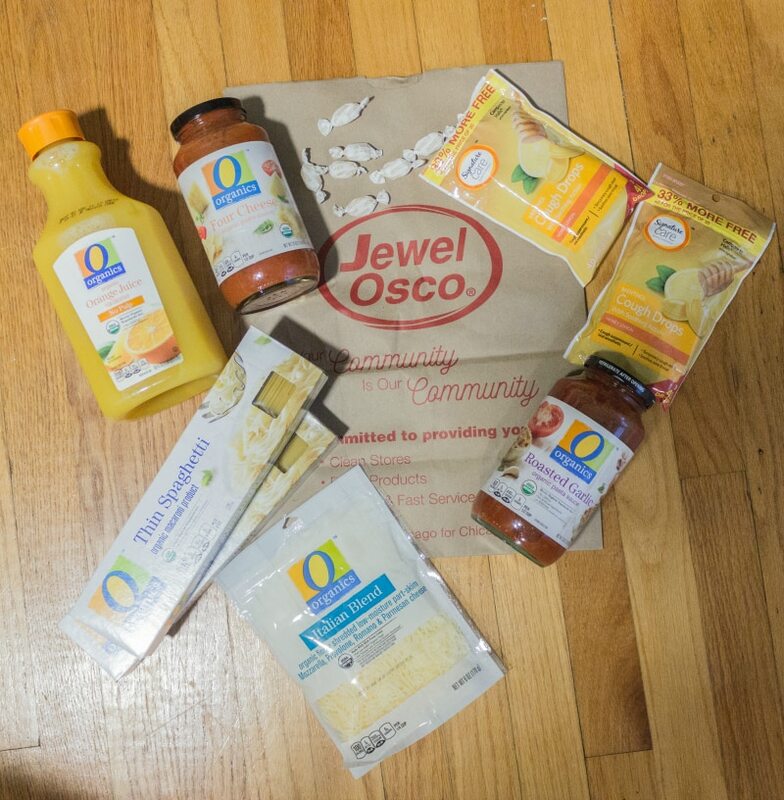 We love the O Organics® line at Jewel-Osco. The quality is unmatched, and no one can beat the prices and convenience. 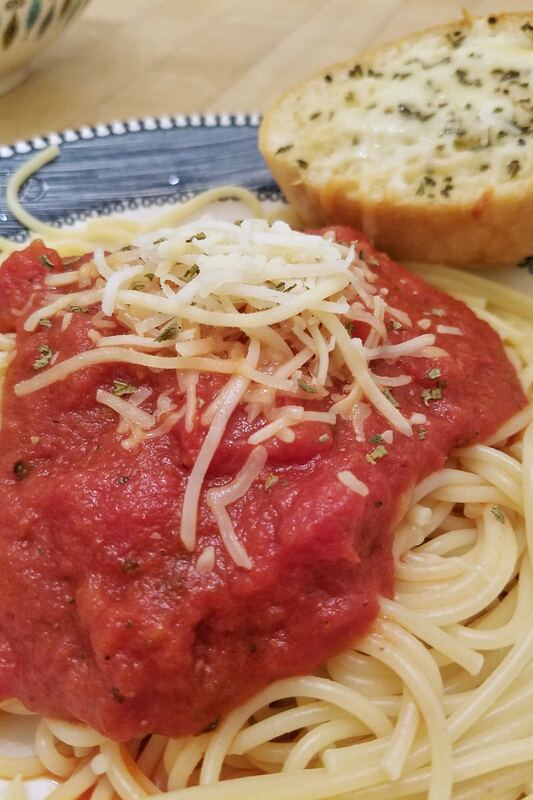 Using the exclusive O Organics® Thin Spaghetti, two jars of sauce (we like to mix the Four Cheese with the Roasted Garlic,) and the Italian Blend shredded cheese, dinner is no longer adding to my daily stressors. 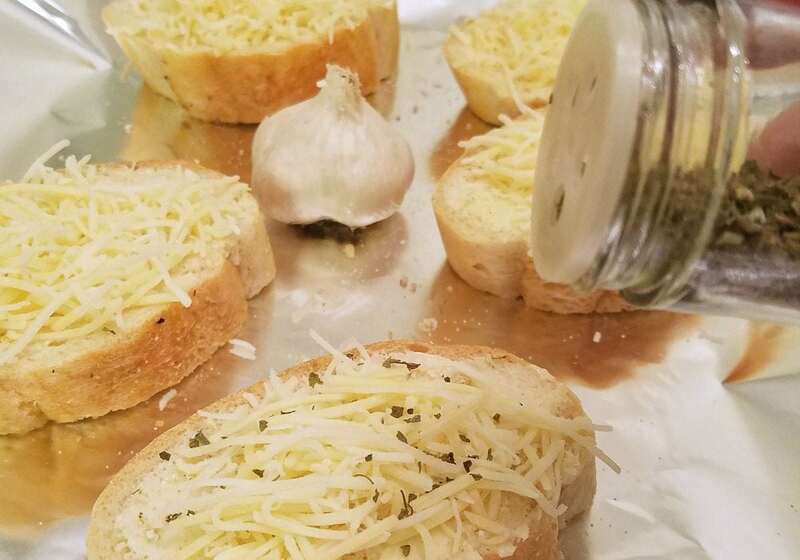 Throw in some quick garlic bread (another opportunity to sneak in more of the potent immune boosters, garlic, and oregano) and voila! A delicious meal packed with vitamin C and all sorts of yum. 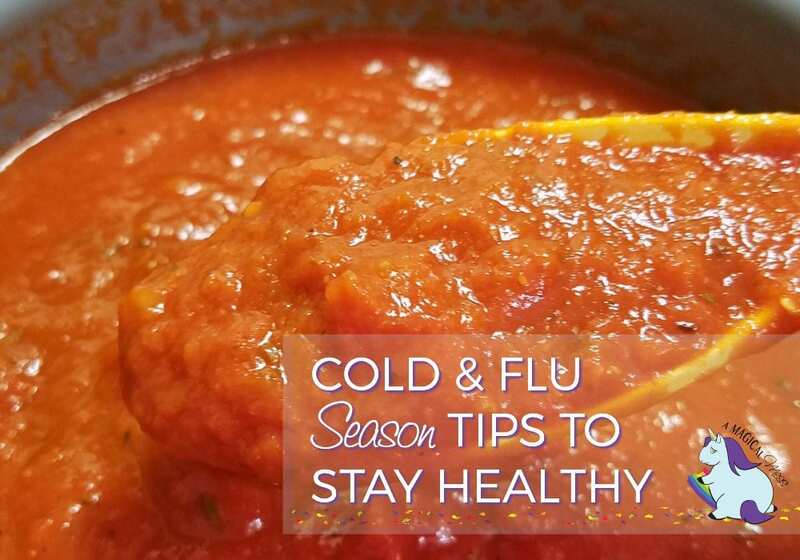 What other cold and flu season tips help you through these months? Share them in a comment below! This is a sponsored post written by me on behalf of Jewel-Osco. Great tips. I have never had the flu and I definitely want to do anything I can to prevent it. Loving these organic options. That pasta sauce looks really delicious! Hoping for a flue-free winter! Cold and flu season has hit us hard the past few years. I’m hoping that this year is better and following your prevention tips will certainly help. Great tips! Getting sick is the worst, so I am all for doing anything I can to help keep germs away. Thankfully, we have an Albertsons store nearby and always do our best to stay stocked up on essentials. Booo!!! To being sick. I hate how it comes right during the most busy and fun time of year and throws plans out of whack too! These are always great tips to remember, though! No one likes to be sick. I think I’ll make some chicken soup in the slow cooker to freeze just in case someone in the house catches a cold. Thanks for the great idea!